If you’re a soccer aficionado, rejoice. In this game of kicking, we kicked a$$! 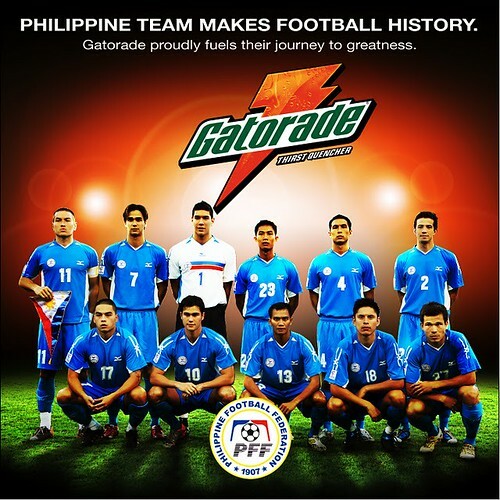 Not since decades ago has our Philippines been as celebrated in international soccer. One game changed all that. Against the defending ASEAN Football Federation (AFF) Suzuki Cup champions, Vietnam—played on their home grass in Hanoi amidst 40,000 Vietnamese—we stunned the hosts. Nobody expected it. We won, 2-0. But we won much, much more: the lavish attention now spotlighted on PHL. After three games at the Suzuki Cup, we were never defeated. In our first game against Singapore, the score was 1-all, thanks to the great Chris Greatwich, who scored during injury time. In Game 2, the upset win against Vietnam; and, last Wednesday, the zero-all draw against Myanmar. Yes. This is what sport is all about. The ability to dream the insurmountable—and to make that vision of the unreal… real. Consider that our Philippine squad was the laughingstock of soccer. Would you believe that, just a few years back, we were ranked 189 out of 208 nations. We were in the top 10 percent… of the world’s worst football-playing countries. Today, our FIFA world ranking should be nearing 140. Obviously, that’s nowhere near Manny Pacquiao’s No.1 rating in boxing, but it’s a major jump and promotion. We should feel proud. Ecstatic. Shout… Yahoo! Yet, we should also feel concerned. Our semi-final opponents, Indonesia, boasting a population of 238 million versus our 92, is a powerhouse. In three AFF Suzuki Cup games, they won all: a 5-1 thrashing of Malaysia, a 6-0 victory against Laos, and a 2-1 score against Thailand. Our Philippine Football Federation (PFF) requested for the Panaad Stadium in Bacolod City—the venue of the 2005 SEA Games and the 2006 AFF Qualifying—to host our game. Sadly, this was turned down by the AFF, owing our minimal seating capacity, among other issues. Both games will be played in Gelora Bung Karno Stadium in Jakarta, a cavernous complex seating 88,000. It’s not only listed as the largest in Southeast Asia—it’s the 10th biggest football stadium in the world. This “home-court disadvantage” is painful for two reasons. One, the boisterous Filipino crowd would have given the Azkals a huge lift. From Davis Cup tennis to the NBA to the Olympics, home-court advantage is important; the influence, tremendous. Two, it’s a loss for Philippine football. Imagine the impact. Imagine the boost to football. I, for one, with sportswriters Nimrod, Mike, Noel, Max, Edri and Rico, plus hundreds of other Cebuanos would have driven to Bacolod. The positive bounce of such a significant event—wow, that’s immense. But, let’s not dwell on what-could-have-beens. The game, as announced, will be in Indonesia. This means one thing: The odds are that, seven days from today, we go home defeated. Those are the statistics. But those same odds also said we’d never beat Vietnam. Maybe, just maybe, our squad, given the nothing-to-lose mentality and buoyed by the Vietnam upset… will win. Who knows? The football is round. If an azkal like Manny can do it for boxing, who says these Pinoys can’t?